Earlier this summer (it’s still summer right?) we traveled out to Colorado to visit my brother, sister-in-law and new baby nephew (!!) Mike and I both love breakfast, so while we were in Denver we had to check out the local coffee shops and cafes, and boy they did not disappoint! We discovered Lula Rose General Store when a long line and a fortuitous parking spot conspired to deposit us on the shop’s doorstep. There’s a reason Eater included Lula Rose on their Ultimate Guide to Denver's Best Coffee Shops. Revived by their awesome cold brew and a slice of fantastic Double Chocolate Zucchini Bread I was ready to tackle the day. I was also reminded A. that zucchini bread exists. Honestly I can’t remember when I last had some let alone made any…? And B. that any and all quick breads involving a vegetable or fruit are vastly improved with the addition of chocolate and preferably also chocolate chips. Tell me I’m wrong. I’ve pretty much been chasing the dream of that bread ever since and now that it’s prime zucchini surplus season I think we’ve all earned the right to consume it in dessert form. Your CSA box will thank me. Preheat the oven to 350°F; lightly grease an 8 1/2 x 4 1/2 inch loaf pan and line with parchment paper. In a large mixing bowl, beat together the eggs, honey, oil, sugar, and vanilla on low speed until smooth. Place the salt, baking soda, baking powder, espresso powder, 1/3 cup of the cocoa, and flour in a fine sieve and sift into the wet mixture. Beat on low until nearly combined – some streaks of flour will remain. Shred the zucchini on a box grater and very lightly press between paper towels before folding into the batter with a rubber spatula. Place and chocolate chips in a small bowl and toss with the remaining 1 tablespoon of cocoa powder, then fold the chips into the batter. In the same small bowl, make the streusel by combining the sugar, cocoa powder, salt, and softened butter. Rub together between your fingers or press with the back of a spoon until a damp, crumbly mixture forms. Sprinkle half the streusel in the bottom of the prepared loaf pan, pour in the batter, and then distribute the remaining streusel over the top. Bake the bread for 55-65 minutes, rotating half way through the baking time, until a toothpick comes out clean (don’t be fooled by melted chocolate chips!) and the cake springs back when lightly pressed. Allow the bread to cool in the pan for 10 to 15 minutes before turning it out onto a rack. Cool completely before slicing. Store well-wrapped, at room temperature. Re-written and adapted from King Arthur Flour’s Double Chocolate Zucchini Bread with reference to the New York Times’s Chocolate Streusel Pound Cake by Melissa Clark. Yes! I used one large mixing bowl, one small mixing bowl, a fine mesh sieve (optional), a 8 1/2 x 4 1/2 inch loaf pan, dry and liquid measuring cups and spoons. A hand mixer, rubber spatula, and parchment paper. Happy day after Mother’s Day! I hope you had a wonderful weekend celebrating the mamas figures in your life, preferably with brunch... I love going out to restaurants, but there are three high holidays in the brunch game that I avoid like the plague: Easter, Mother’s Day and Father’s Day. The lines are long, the reservations hard to come by, not really conducive to relaxing and enjoyable meal. Hence, brunch at home. Mike’s parents were in town this weekend and with both Mother’s Day and my mother-in-law, Lucy’s birthday coming up on Tuesday I had an excellent excuse to go a little bananas with our brunch menu. Spinach frittata, crispy thyme potatoes, bacon (obviously), OJ, fresh fruit salad and the literal icing on the cake: Grapefruit Olive Oil Muffins. I’ve been wanting to make a citrus olive oil cake for months now, but never really had an occasion, not that you really need one for this delicious cake as it turns out. I came across this recipe by Ashley Rodriguez who writes the beautiful blog Not Without Salt and I was intrigued by using grapefruit. I played around with the recipe a little until I got what I wanted – intense grapefruit flavor, a moist muffin, and just a little sweetness from the glaze. Preheat the oven to 350 degrees F. Lightly coat a loaf pan with non-stick spray or place paper liners in the muffin tins. Add 1⁄2 cup grapefruit juice to a small saucepan set over medium heat. Bring to a simmer and reduce the juice by half. Cool slightly. In a small bowl, combine 1 tablespoon grapefruit zest, yogurt, eggs, olive oil, vanilla extract, and reduced grapefruit juice and whisk to mix well. In a separate medium bowl, add the granulated sugar, all purpose flour, baking powder, baking soda, and kosher salt. Whisk to combine. Add the wet ingredients to the dry ingredients. Mix until everything is well blended. Pour the batter into the prepared pan and place in the hot oven. Bake until the cake is deeply brown and set and springs back gently when pressed, 50 to 55 minutes for cake or 25-30 minutes for muffins. Let the cake or muffins cool in the pan for 5 minutes before turning out to cool on a wire rack. While the cake comes to room temperature, prepare the glaze. In a small bowl, combine the remaining 1⁄2 tablespoon grapefruit zest with 5 teaspoons grapefruit juice and 1 cup plus 2 tablespoons confectioners’ sugar until well mixed to create a thick, but still pourable glaze. Place the cake on a serving platter and drizzle with the glaze, or swirl the tops of the muffins to coat with glaze. The cake can be made 1 day in advance. Slightly adapted and rewritten from Ashley Rodriguez’s Grapefruit Olive Oil Cake with Bittersweet Chocolate via Not Without Salt. Yes! I used one medium bowl, one small bowl, a small sauce pan, and two muffin tins (or one loaf pan.) I also needed a microplane grater, utility knife, dry and liquid measuring cups, a wire whisk, and a rubber spatula. If you’re making muffins an ice cream scoop is really helpful for portioning the batter. This cake is the perfect way to round out a breakfast table with a sweet bread that doesn’t stray into cloyingly sugary territory. The flavors are light and refreshing, and personally I like the slightly bitter edge that grapefruit offers. This cake is simple to make and could easily be the basis for a sweeter version suitable for a summer dessert. Well, it’s January again, 2015 is underway, and resolutions are in full effect. Mike and I took advantage of our four-hour drive back to the city from Upstate after Christmas to talk through the coming year and think about what we’d like to accomplish. We both resolved to be healthier this year, so I’ve been thinking about ways to incorporate more vegetables into our meals. I’ve also been in the mood for warm, cozy recipes and to me there’s pretty much nothing cozier or more perfect for grey winter days than roasted root vegetables. 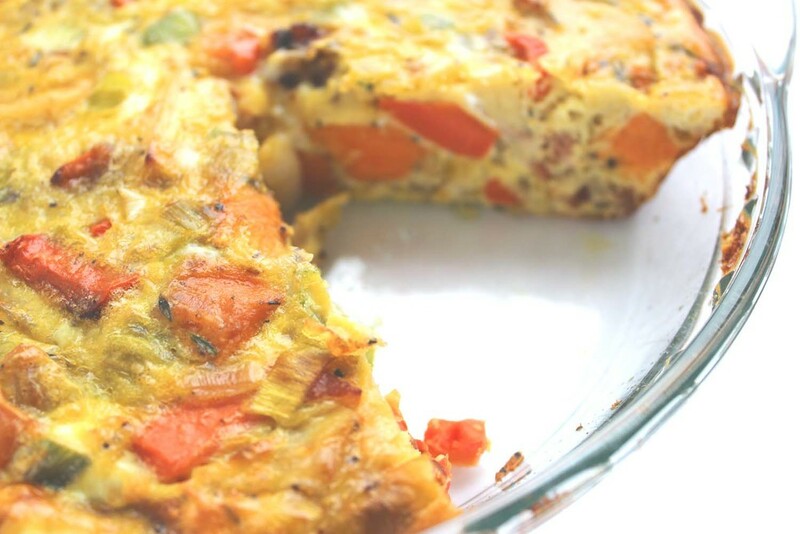 Frittata is one of my all-time favorite things to make for both brunch and dinner (other examples here and here) and this one uses a mixture of carrots, parsnips, and sweet potatoes lightly caramelized in the oven. The root vegetables are then pared with sautéed leeks, onions and thyme to combine the rich savoriness of the vegetables with fresh green flavors. A sprinkle of salty, crispy bacon balances everything out. Yum! This recipe is the best of both worlds – it tastes so good and doesn’t leave me with a sense of deprivation – healthy eating I can get behind. And, you know it's good when I offer Mike a taste and he goes back for a second bite. Peel and dice the parsnips, carrots, and sweet potatoes into 1 inch pieces to make about 2 generous cups of root vegetables. Spread evenly on a parchment paper-lined baking sheet and toss with 1 1/2 tablespoons olive oil, 2 teaspoons kosher salt, and 3/4 teaspoon freshly ground black pepper. Roast at 400 degrees for 25-35 minutes, or until easily pierced with a fork, turning halfway through the cooking time. Set aside. After the root vegetables are cooked, reduce the oven temperature to 350 degrees. Place the two strips of thick-cut bacon on a baking sheet and bake for 20 minutes, turning midway, until crisp. Drain the bacon on a paper towel and allow to cool slightly before mincing into 1/4 inch pieces - this will make about 1/3 cup of bacon. While the bacon cooks, prep the onions and leeks. Remove the tough, dark green ends and the root from the leeks and cut the remaining white and light green stalk in half lengthwise. Rinse thoroughly with water to remove any sand. Dice the leeks into 1/4 inch strips and the onions into 1/4 inch pieces. In a large sauté pan or non-stick skillet, heat 3 tablespoons of olive oil over medium-low heat and cook the leeks, onions, 1 1/2 teaspoons minced fresh thyme, 1 teaspoon kosher salt, and 1/2 teaspoon black pepper until translucent, about 10 minutes. Once the onions and leeks are softened, add the roasted root vegetables and minced bacon to the sauté pan and stir to evenly combine. Spread the vegetable mixture in a 9 inch glass pie plate that has been coated in a light layer of non-stick spray. Beat the eggs, 2% milk, 1/4 teaspoon kosher salt, and 1/4 teaspoon black pepper in a medium mixing bowl. Pour the eggs over the vegetable mixture in the pie plate. The vegetables should be nearly, but not entirely covered. Bake at 350 degrees for 35-40 minutes, or until the eggs are set and the top of the frittata is lightly browned. Jiggle the pie plate slightly to check – if nothing moves the frittata is done. Allow to cool about 5 minutes before serving. Fairly. I used two baking sheets, one large sauté pan, one medium mixing bowl, a medium cutting board and a 9 inch pie plate. I also used a chef’s knife, wooden spatula, whisk, vegetable peeler, liquid measuring cups and measuring spoons. Lining the baking sheets with parchment paper will also be helpful with clean up. Honestly, I surprised myself with this recipe - to be honest, I was a little nervous about how it would turn out. Mike and I both really liked the balance of sweetness from the root vegetables with the savory flavors of the bacon and leeks. Mike says he’d eat frittata all the time, and we would both absolutely eat this frittata again. I served it with vinaigrette dressed arugula leaves and the combination makes this frittata a strong contender for brunch or for dinner. Let’s be honest, cooking for breakfast presents different challenges than cooking for dinner and it’s not just the early hour (although that doesn’t help!) Cereal is my go-to when I’m by myself, but the Martha part of my brain won’t allow a stack of bowls and an assortment of boxes when we have guests. So, what to serve that will feel like a real, satisfying meal and get the day started right? For me it’s frittata, which is basically a fancy word for breakfast casserole. Eggs + filling = an easy, crowd-pleasing, all-in-one dish. Even better? It’s adaptable to whatever you’re in the mood for or have on hand in the fridge. In this case I kept it classic with cheddar and bacon for great flavor combined with roasted potatoes and bright green broccoli to add a little green to the mix. A little toast, fresh fruit, or a side salad and breakfast is served. Peel and dice the potatoes into 1/2” cubes. Arrange the potatoes in a single layer on a sheet pan and drizzle with 2 tablespoons olive oil, sprinkle with 2 teaspoons kosher salt, and 1 teaspoon black pepper. Toss to evenly coat with the olive oil and seasonings. Roast in the oven for 30 – 35 minutes, turning halfway through, until lightly browned and easily pierced with a fork. On another sheet pan arrange the strips of bacon. Place the sheet pan in the oven and cook for 15-20 minutes until crispy. Drain the cooked bacon on a paper towel lined plate and set aside until cooled. Then, dice into small pieces. Meanwhile, trim the broccoli stems and cut the crowns into bite-sized florets. Grate the cheddar cheese and set aside. In a medium bowl, beat the eggs, milk, 1 1/2 teaspoons kosher salt and 3/4 teaspoon black pepper. Spray a 10” pie plate or 4 x 4 baking dish with non-stick spray and layer half the cooked potatoes and broccoli. Next, add half the grated cheddar and bacon pieces; repeat with the second half of the filling. Finally, pour the egg mixture over the top to cover the filling. Bake for 50-60 minutes until the center is set and the top of the frittata is lightly browned. Serve immediately with toast points or side salad. Yes, absolutely. I used two sheet pans, a 10” pie plate, one medium cutting board, one chef’s knife, a medium bowl, box grater, vegetable peeler and measuring cups & spoons. Well, considering that there were only three of us and only about a quarter of the frittata remained when we were finished I’d say this one was a winner. 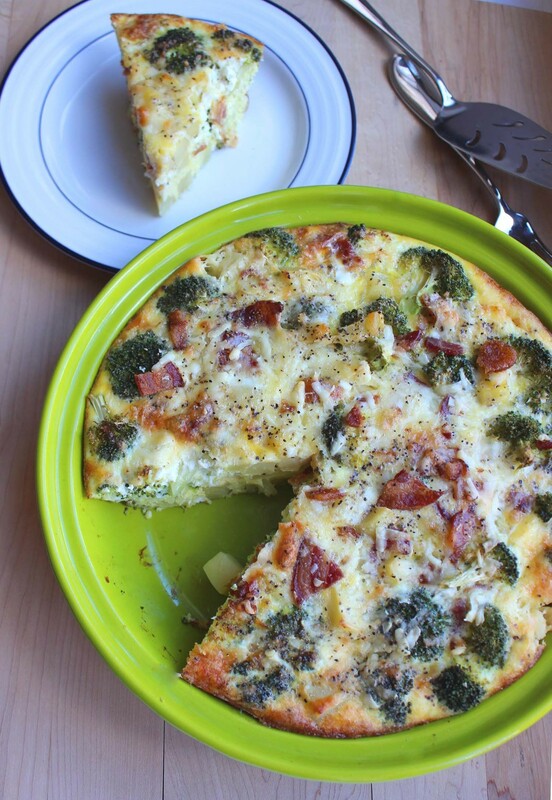 It combines great breakfast flavors – eggs, bacon, and roasted potatoes – with more savory cheddar and broccoli to create a well balanced dish. I’d made this again for a brunch party or even for dinner.